Most year’s we’re hopin’, wishin’, prayin’ for snow by Christmas. The magical white Christmas all fans of the yule tide holiday dreams of. Sadly though, I can count on less than 10 fingers all the years there’s actually been snow on Christmas Eve or Christmas Day. This includes actual accumulating snowfall, and just the picture perfect fluffy flakes coming down outside the window. When we do get snow, good snow, it’s usually in the middle of January-middle of February- with an almost guaranteed outlier of a snow storm in the month of March. Y’all- there were flurries last night, and flurries this morning. No accumulation; the moisture just wasn’t in the works, but still! This weekend our first snow storm of the year is forecasted. I am beyond excited. I mean Facebook’s Angry Weatherman (a local celebrity) predicted a much more active season than normal for us- but to see it in action is the best. If you don’t hear from me today, don’t worry- I’m fine. I’ll just be elbows deep in totes in my closet pulling out everyone’s hats, gloves, bibs, and boots. I wait all year for all things Winter. The rehearsal’s are over, now it’s time to hit the deck- full steam ahead. Not gonna lie, even though the kids were off at school- I bundled up, put my boots with the fur on, and enjoyed my morning coffee after the last bus pulled away on the front porch watching the beautiful flakes fall amid all the trees in my front yard. Thank goodness for stainless steel, insulated coffee cups- otherwise neither me or my drink would’ve made it for more than a few minutes. But we did, and it was beautiful & serene. About the only way this admittedly non (as in never) a morning person looks forward to get out of bed before 8 am. Another thing this snowfall and the colder weather has me looking forward to? 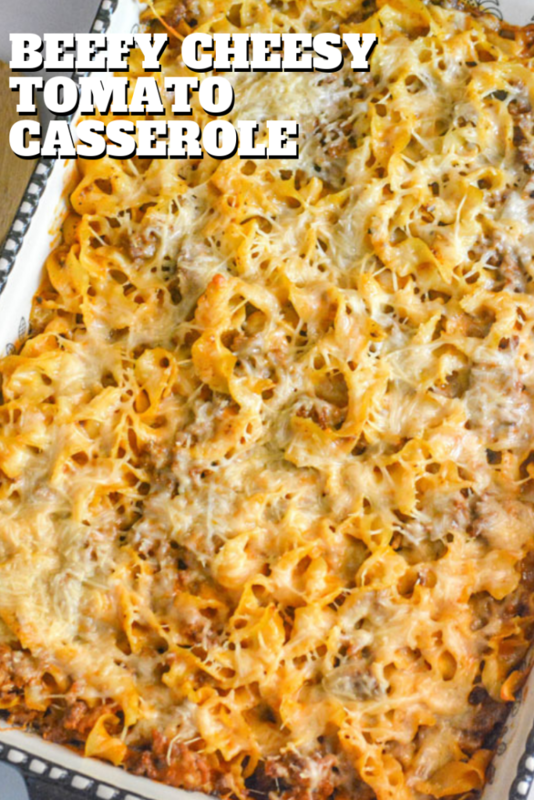 Our favorite warm, creamy casseroles. 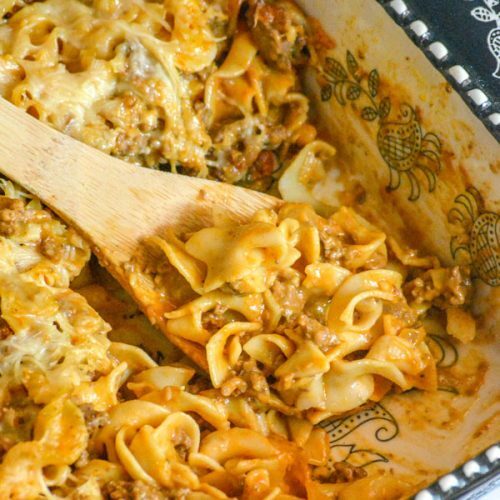 A combination of hearty beef, energy laden pasta, and rounded out with a headpin’ helping’ of comforting cheesy goodness. It’s the best way to stave off a chill, or to enjoy a bowlful while watching the snow fall. 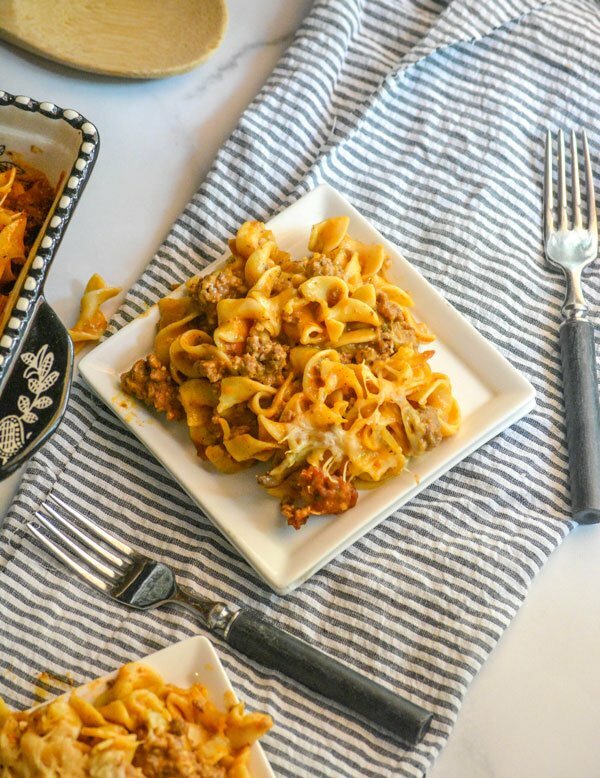 Beefy Cheesy Tomato Casserole checks off every item on the Winter weather must-have list for a cozy supper. 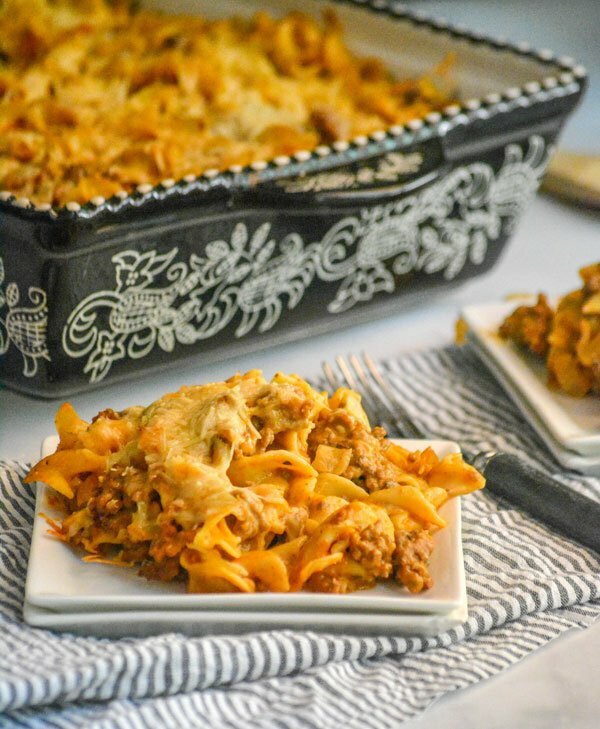 When I say this Beefy Cheesy Tomato Casserole is quick & easy, I’m not kidding. It does involve a couple of different steps, but each are simple and they combine into a magical meal. You’re gonna start by boiling your egg noodles according to the package direction, with one exception. Typically on pasta package instructions, there’s a minimum and a maximum you want to cook them to get them to that perfect ‘al dente’ state of being. 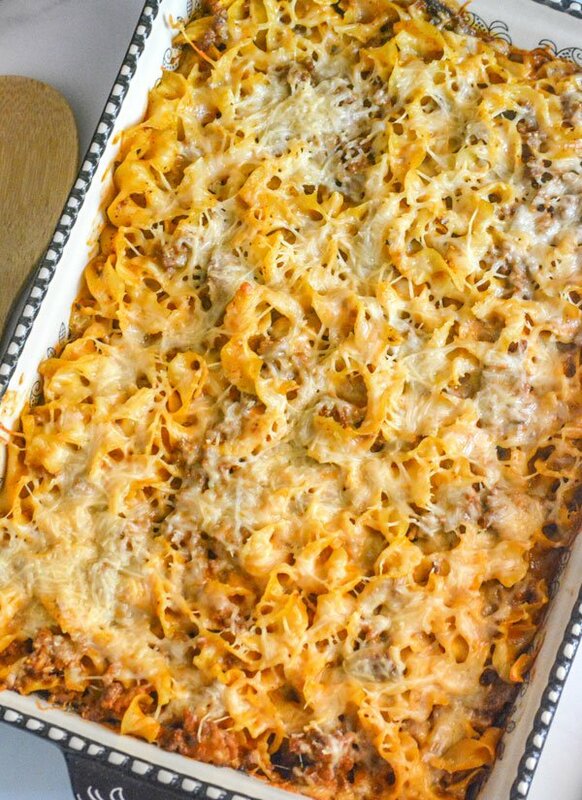 Since the noodles will continue to cook when they’re baked in the casserole dish, you only want to cook them to the minimum suggestion. Then immediately transfer them to a colander to drain, and run them under cold water until the cooking process stops. We don’t want them to continue cooking in any form, and then end up mushy and gross by the end. Pasta can be a fickle thing if not handled carefully. While the pasta’s cooking, we don’t want to waste time since ideally everything will be done around the same time. Sautée the ground beef, stirring and breaking up, over medium high heat until it’s cooked through. Strain the fat, and set the meat aside. Get a large mixing bowl, you could use smaller, but I suggest a larger size so that you don’t have to be overly careful when stirring so many ingredients together without making a mess. To this bowl, you’re going to add both the condensed tomato soup and the condensed golden mushroom soup. No, not cream of mushroom soup (although that will work, too), but one specifically labeled golden mushroom soup. Whisk them together until evenly combined. Next, add the half & half, Worcestershire, and garlic powder- stirring together until evenly combined. Salt & pepper the mixture, to taste. Then stir in the cooked meat and pasta noodles until the whole thing’s evenly combined. Transfer this mixture to a lightly greased 9×13 inch baking dish, spreading out as necessary. Sprinkle the shredded mozzarella and Parmesan cheeses evenly out over top. 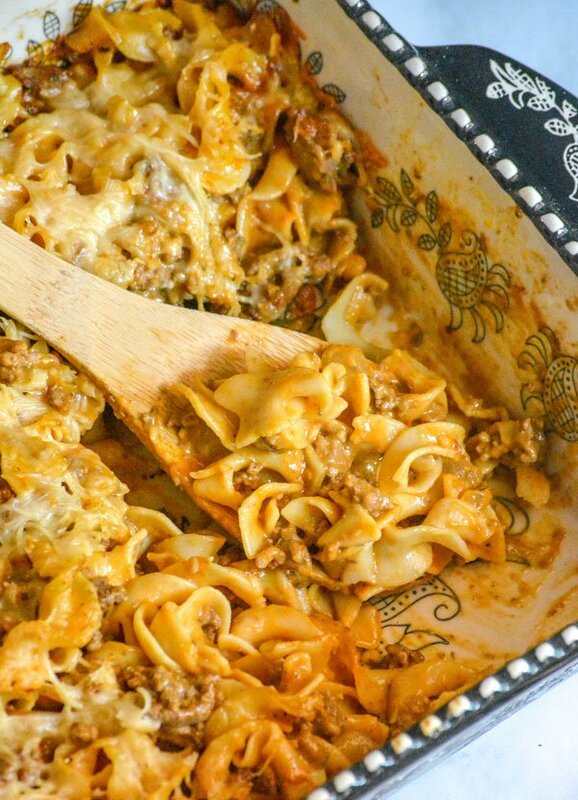 Bake this Beefy Cheesy Tomato Casserole at 350 degrees for 25 minutes. Let the mixture rest for 1-2 minutes before scooping and serving. 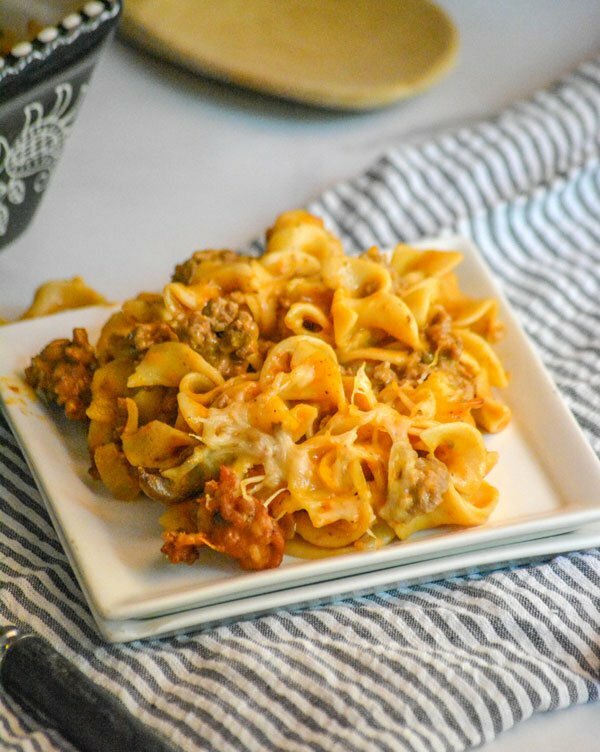 This country style casserole is loaded with hearty ground beef, a luscious tomato and mushroom soup sauce, comforting pasta noodles, and baked in a casserole dish under a cheesy mozzarella Parmesan topping. 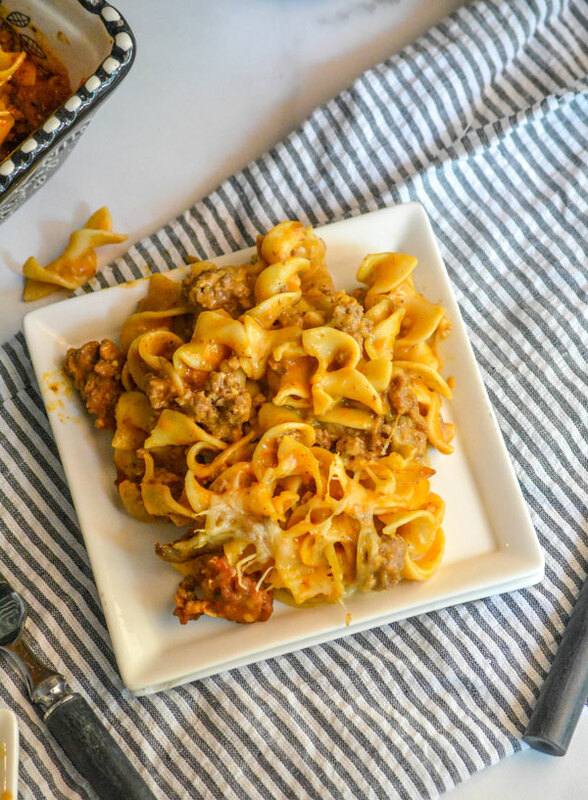 Whether you’re excited or let down by the colder weather infiltrating everything, this Beefy Cheesy Tomato Casserole is everything you could possibly want to look forward to at the supper table, whichever side of the spectrum you fall on! 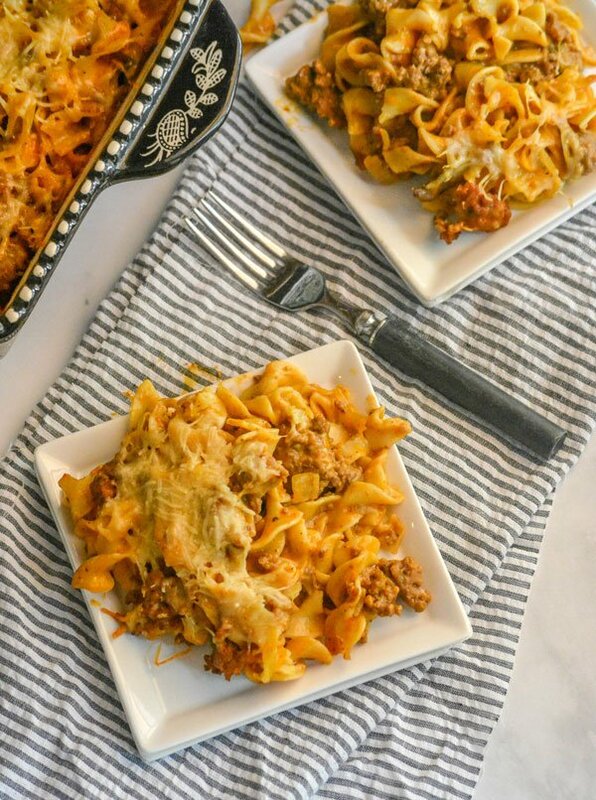 A creamy country-style casserole, this delicious dish features a tomato and golden mushroom based sauce, with hearty ground beef, and a heaping helping of cheese for the ultimate comfy cozy dinner dish. Cook the noodles for the lowest recommended amount of time on the package. They will finish cooking later in the oven, and you don't want them to over cook and turn mushy. Drain the cooked noodles, and then run them under cold water, tossing, to stop cooking. While the noodle are cooking, sautéed the ground beef in a large skillet over medium high heat- stirring & breaking it up as it cooks. When cooked through, drain the meat, and set aside. In a large mixing bowl, stir together the condensed soups until evenly combined. Add in the half & half, onion, Worcestershire, garlic powder, and salt & pepper- stirring to evenly combine. Now add the cooked meat and the noodles, stirring to evenly combine. Transfer the casserole mixture to a lightly greased 9x13" casserole dish. Use a spatula tp spread out the mixture evenly. Sprinkle the mozzarella evenly out over top of the casserole. Then sprinkle the Parmesan. Bake the dish at 350 degrees for 25 minutes, or until heated through and the cheese has melted and begun to turn golden brown. Let the mixture rest 1-2 minutes before scooping & serving. Enjoy! Thanks for sharing with Fiesta Friday, have fun and a great weekend! This sounds like the dish my mother would leave for me when she went out with my dad and left us with a babysitter. We always looked forward to it, how can you go wrong with that cream melty cheese? Just the type of dinner I would have enjoyed on a cold winters day. Thank you for bringing it to FF.